An issue we frequently have is that a faculty member has a great video on YouTube which they use for class, but the captions aren’t anywhere near the necessary 99% accuracy they need. Now you can use DIY Captions. Once you goto the page scroll down to the second search box which allows you to enter a URL. Paste in a link to a public YouTube video which has captions, and hit enter. Depending on the length of the video it could take a few seconds to a few minutes. You will then see a screen which looks like this with the video, an editable box, and the transcript on the right. You will be able to play the video, and see the transcript. The captions appear one line at a time which allows you to quickly edit them, or hit tab to continue if, or once they are correct. Once you are done you can select the dropdown menu to download the caption file. Amara , and you can upload the caption file. The video is hosted through YouTube and displayed through Amara with the accurate captions. You will need to use the Amara URL when you link to it in your classes. Captions for a live presentation? April 2, 2019 / vmart02s / Comments Off on Captions for a live presentation? For those who would like to make their conference presentations more accessible or understandable, Microsoft has recently released an add-in for PowerPoint. By following the hyperlink you’ll find the first item on the page is “presentation Translator for PowerPoint” Download Now. Click Download. 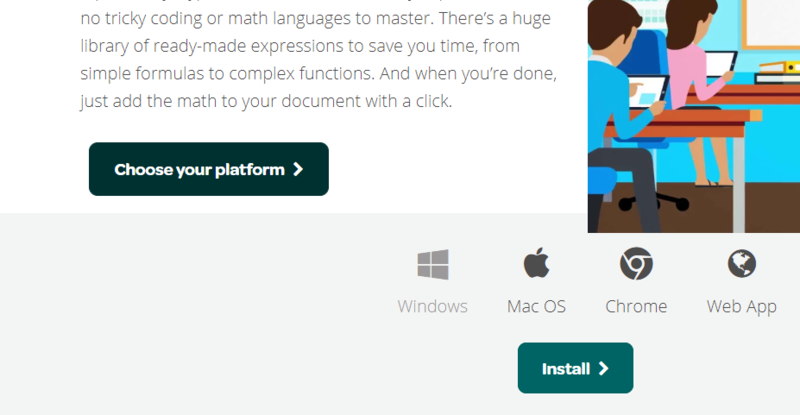 You’ll then be taken to a new page with a dropdown menu for your language, and next to it another download button. At this point there are 10 language options. Select your language, click Download. This will now download the add-in, once it has downloaded, select it from your browser’s download area to begin the install. Depending upon your current configuration you may be required to download a few extra Microsoft-add ins as well. Then you can open your PowerPoint, and under the Slide Show tab you should have a new option on the far right, “start subtitles”. Click it. You can now select what language you will be speaking and the language you would like for subtitles. At this point if you select that you are speaking German and would like German subtitles, you will get German subtitles. You are able to do this for any of the 10 language options. If you select you are speaking Chinese and would like English subtitles you will get English subtitles. You are able to convert Chinese to English and English to Chinese only at this point in the live subtitles. However, once the PowerPoint opens you will have a QR code which you can share with your audience. By using the QR code your audience can follow the presentation on their device seeing a live translation into any of the other 8 languages. So if you are speaking in German, with German subtitles, the audience can view the translation on their mobile device or laptop in English. The audience is also able to ask questions via their device in their language and have the question translated. At this point the software only works on the PC version of PowerPoint, and you must have an internet connection, and a microphone. The subtitling is done by an AI engine and is about 80-85% accurate. It will become more accurate the more you use it, if you continually use the same device. This should not be used for making recorded course videos as the captions cannot be corrected to 99% accuracy nor turned off. This is an excellent tool for live presentations, or presentations with different language speakers. 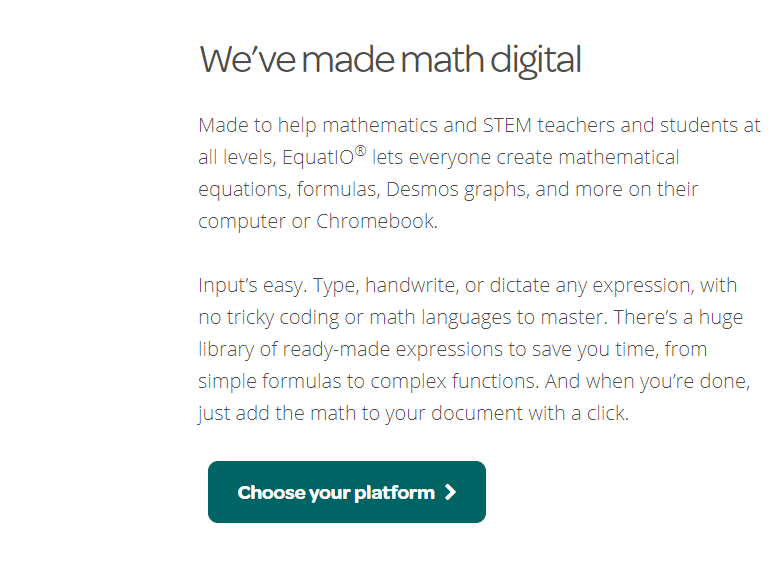 Over spring break we acquired a site wide license for digital math software Equatio. 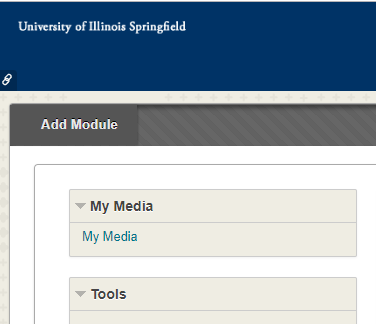 This means any faculty, staff or students with UIS email can download the software. This gives you a two and half minute overview of the software. The software is designed for STEM fields which use equations allowing input by typing, writing, or dictating equations. The software can also read out equations in a paused video, a PDF, Word form, or almost any digital format. In the coming weeks we’ll talk about ways to use this software to help with accessibility as well. This week I’d just like to let you know how to download it. 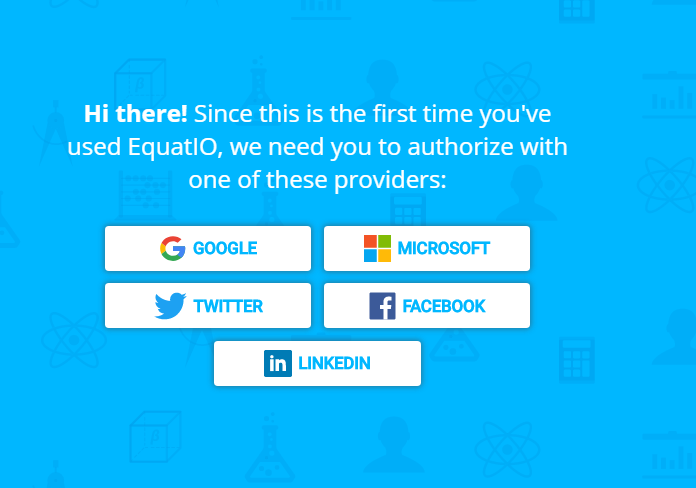 First goto the Equatio website. When you click on the choose your platform button you will have four options: Windows, Mac OS, Chrome, and a webapp. Select the version you would like to install then click the install button. For this walk through we are selecting windows. You will then have a new window which will allow you to download for Windows or Mac, for this walkthrough are selecting Windows. 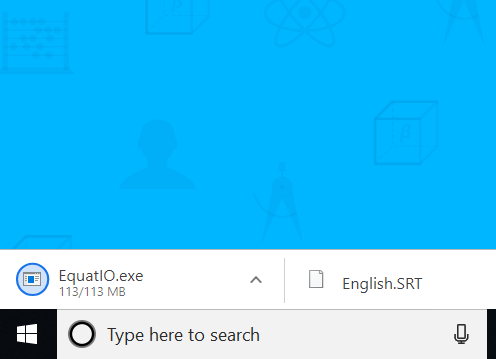 Since Chrome is the browser the file has downloaded to the bottom left hand corner, the EquatioIO.exe file. 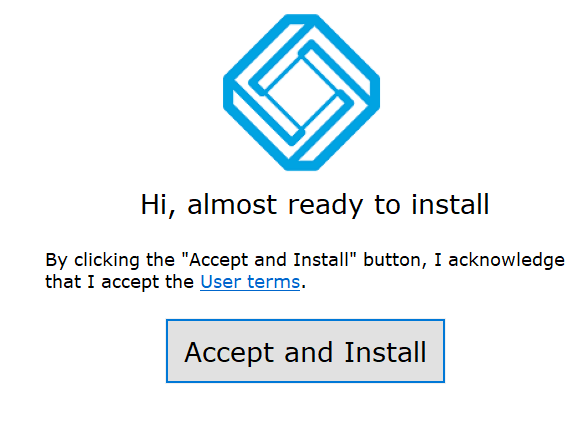 When you select the file, a new screen will pop up asking you to accept and install, click accept and install. Another screen will popup asking you how you would like to authorize your account. For UIS you can click either Microsoft or Google. On the screen which pops up, not shown, please enter your UIS email address. This will take you to the final screen where you can enter your NetID and password. Equatio is now installed. 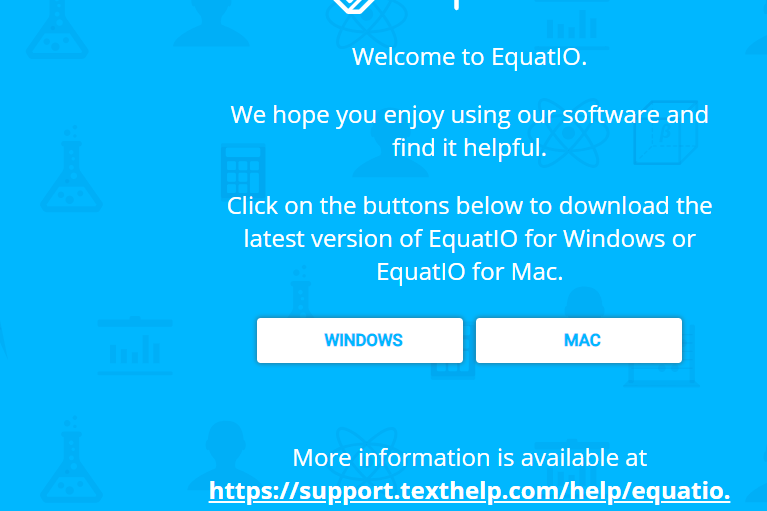 Please check out the Equatio website for more on how to use the software. There will be a live software webinar for UIS faculty and staff on April 10, from 2-4 pm. If you are interested in attending the webinar please email vmart02s@uis.edu. It will be recorded and we will share that info with you at the time. We will have some more examples of how to use Equatio in the coming weeks. Recently I presented at the 44th annual ICCHE conference on the work of our student accessibility workers, and it seems fitting to share some of the results of this work with UIS faculty and staff. UIS made a bold statement by hiring a team of student workers to assist my office with the task of institutional accessibility in February 2018. By mid-March four students were hired, and began their training. The student worker team launched the accessibility work in late March. Over the summer faculty continued to work on accessibility issues, and the library expanded their accessibility work with our office, as well. As I mentioned at the end of last semester the library began making their scanned course reserves accessible. This has been a major move as it allows faculty to have one place to contact to get their materials scanned, made accessible, and posted for online access. We had a substantial decrease in the Word files received which is credited to all of the faculty who attended workshops, reached out, or came to COLRS for one-on-one consultations with the Accessibility office within the last year. To faculty who are making accessibility of digital documents for their students a priority, thank you! And in this semester, along with continuing work on courses, we’ve been doing work for some of the OER fellows to make the materials they are adopting or writing accessible for all users. These efforts have pushed the skills of the student workers to a new level. The Accessibility Team has now made an entire textbook accessible for one of the OER faculty fellows teams. So thanks for the excellent effort: Alana, Brandon, Daniela, and Kayla. In the past we have looked at how to use the accessibility checker built into Word. It highlights issues and explains how to fix them. We’ve also looked at how tables should be laid out properly. A common issue with tables – that PC users of Word using the accessibility checker will see – is that the table must have alternative text and a specified header row in order to be considered accessible. 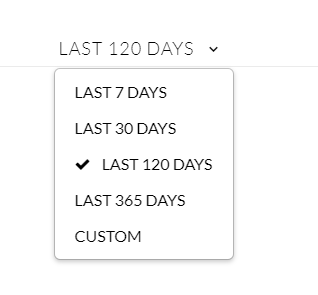 Alternative text for a table should usually list the items in the header row. With a syllabus, for example, this might be something like week, reading, and due date. It gives a screen reader user an idea of what is in the table. Specifying the header row allows a screen reader user to know that the top row lists the type of information which will appear in the following rows. For example: One, Two, and Three corresponding to Week One, Week Two, and Week Three. Open those files in Word on a PC, run the accessibility checker, and fix them. Recently we conducted a survey of department chairs concerning accessibility. The greatest number of respondents were interested in handouts on how to make specific file types accessible. The handouts below cover the most common file types in courses at UIS. The second highest number of respondents were interested in workshops, and in mid-October we held a three day workshop attended by 18 faculty and staff to help them learn more about accessibility. Departments may schedule workshops on specific accessibility topics (or other teaching and technology topics) for their faculty. Of course, faculty are welcome to schedule individual consultations at any time. COLRS is happy to announce the Fall 2018 team of student workers who will be helping faculty make their course materials accessible. The students began work September 10, and as of this week have completed work on fifteen classes. Each college will determine their own prioritization of courses which need accessibility help, and each college dean will share that list with Dr. Vickie Cook, Executive Director of COLRS. Dr. Vance Martin, Campus Accessibility Specialist, will then contact the faculty members from the list for instructions on how to share the materials, and once all materials are received, he’ll work with the Accessibility Team to help make the materials accessible. 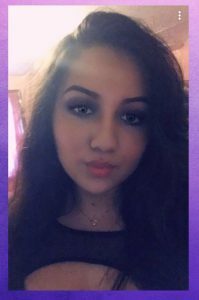 Daniela Arizmendi is from Waukegan, IL. She is majoring in English and minoring in Secondary Education. She plans to attend Graduate school to pursue a Masters in Education. She loves food, movies, and makeup. Kayla Thomas is a transfer student from Richland Community College. She is majoring in English with double minors in Communications and Global Studies. She is also the co-managing editor of the Alchemist Review and has been accepted into the National Honors Society of Leadership and Success. She has one dog and four cats who take up all of her free time! 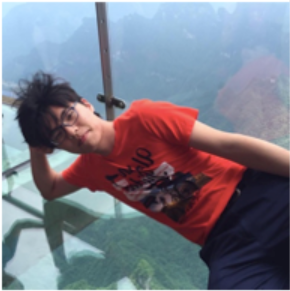 Yuxuan Zhang, “Xuan”, is in his senior year at UIS. 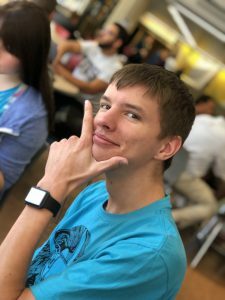 He is majoring in computer science. He is from China, and his hometown is near Shanghai. He likes playing computer games, watching movies, and playing with drones on the weekend . This is his second year working for COLRS. J.R. Gomoll is in his junior year at UIS. He is majoring in computer science. He is from Richmond, Illinois. This is his second year working for COLRS. PDFs have been used in a variety of ways in higher education: from a medium to share articles and book chapters, to a format for saving document files which can be opened on various platforms. However, when we think about the accessibility needs of students, PDFs become more problematic. For scanning a book or article, creating a PDF is still a useful means for sharing the materials, but we still need to follow procedures to make the scan accessible. For those who are writing course materials in Word or Pages, or some other word processing software, and saving the file as a PDF, there is a more accessible way to share that same information within Blackboard. Create the file as you normally would. (If in Word, run the accessibility checker.) 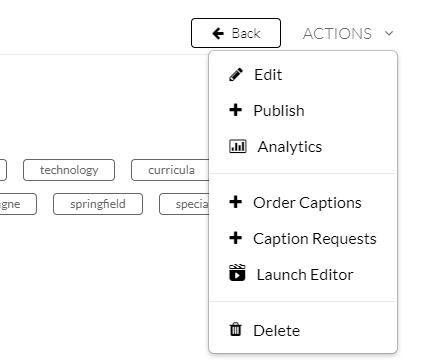 In Blackboard, under the “build content” tab select “blank page”. Enter a title for the page where it says “blank page”. Then copy the material from your word processing software and paste it in the content area, scroll to the bottom and select submit. That content is now much more accessible than in a PDF, and quicker to open regardless of platform. June 1, 2018 / vmart02s / Comments Off on How to get a clean transcript from a caption file. If you already have a 99% accurate caption (.srt) file proceed step 6. 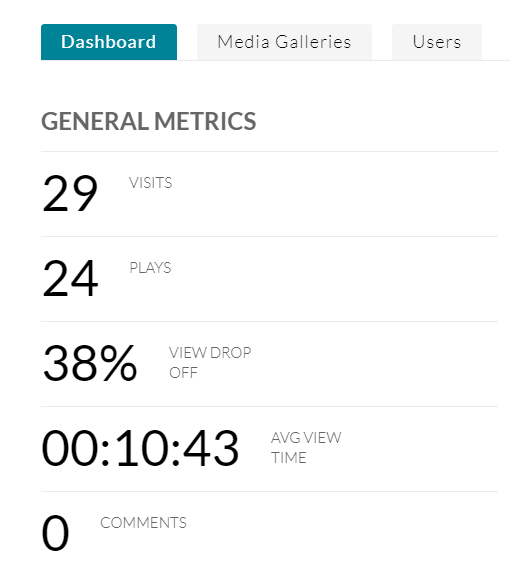 If you have a 99% accurate captioned video in Blackboard, goto My Media. Next to the video, click the greyed out pencil highlighted below with the red arrow. You will then be on a screen with 9 options below your video, one of them is captions. Click captions. You will now see the language and label for the caption file. On the far right clicked the greyed out download icon, highlighted below with the red arrow. This will download your caption (.srt) file to your computer. Goto the subtitle tools website. Now click the “Download” icon and this will download the transcript file to your computer. Perhaps you are seeing OERs or Open Education Resources mentioned more frequently at your disciplinary conferences. Or perhaps there are initiatives on your campus to promote OERs, like at UIS. In general OERs are materials made by other instructors, anywhere in the world, who are willing to freely share them with others. Do you need to think about accessibility with OERs? Yes. However, it shouldn’t be a stumbling block in your adoption of OERs. If you adopt OERs for your class you should check them for accessibility, as you would any other materials, and as you review them for fitting with your learning goals. As we’ve discussed, running the accessibility checker for Word files, PowerPoints, or PDFs can tell you how accessible something is and how to fix it. In most cases, academic materials which are termed OER are licensed under a creative commons (CC) license. There are six different licenses. If the license is “attribution-non-commerical-no derivs” or “attributiuon-no derivs” and the material is accessible then you can use it, but make no alterations and you must credit the license holder. For the other four licenses you can alter the materials to make them accessible or alter and add other content to them, just remember to credit the original creator/licensor. For those about to make a Word Document into a PDF, we advise you. April 9, 2018 / vmart02s / Comments Off on For those about to make a Word Document into a PDF, we advise you. With Acrobat installed on your computer you should have an ACROBAT tab in Word, select it. Under fonts settings (still under the advanced settings window) make sure the “subset embedded fonts when percent…” is checked. Finally, you’ll still need to run the Acrobat accessibility checker, as also linked above. Yes, Word does have a save as PDF option. However, when it comes to accessibility doing the above steps will reduce your work in making the final PDF accessible. There is an accessible course syllabus template in Word on the Academic Affairs website. We’ve posted several tips on accessibility and Word, as well as presented several campus wide and department level sessions on Word over the past few months. And many of the files that the Accessibility Team has worked on thus far have been Word files. So once we’ve used the template, worked on our files, or had the Accessibility Team work on them, we’re done? Maybe. It is always a good idea after making any edits or opening and saving a file on a new computer to run the accessibility checker. Why? Any edits we make could add a new accessibility issue to the file. Or sometimes there are settings on one computer which will override the look of a file, which can also lead to accessibility issues. So how do we run the accessibility checker again? You can run the accessibility checker when you’re creating new files, as a tool to find out issues in old files, or to make sure all your changes are still accessible. Jalee Braner is in her freshman year at UIS. She is double majoring in elementary education and English. 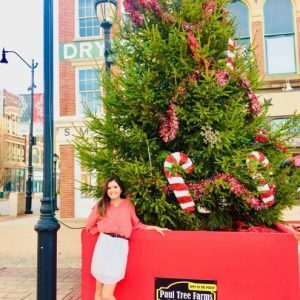 She is from Springfield, Illinois and plans to teach in Springfield for at least 2 years after she graduates. She likes working out and spending time with friends and family. J.R. Gomoll is in his sophomore year at UIS. He is majoring in computer science. He is from Richmond, Illinois. 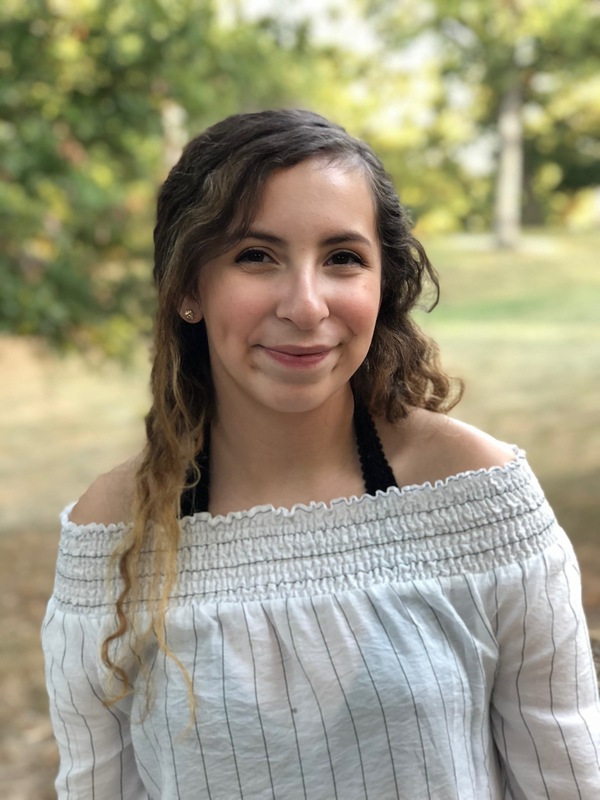 Genesis Reyes is in her freshman year at UIS. She is majoring in business administration and minoring in Spanish. She is from Grayslake, Illinois. Yuxuan Zhang, “Xuan”, is in his junior year at UIS. He is majoring in computer science. He is from China, and his hometown is near Shanghai. He likes playing computer games, watching movies, and playing with drones on the weekends. Recently I saw a post on Facebook with a blue circle, with a barely lighter blue rhino in it. It equated intelligence with the ability to see the rhino. It made me think of the need to keep color in mind in our instructional materials. Around 8% of men and 1% of women of Northern European descent are color blind. And the older we get the more difficulty we all have with certain color combinations. So it is important to think about this for our students, if you like to use color in your documents or presentations. Below are some known color combinations which are highly problematic. This website by Giacomo Mazzocato or by WebAIM can give you an online color checking tool. The Paciello Group Website has a downloadable piece of software for Mac and PC which you might also find useful. If you use lots of color, please check the contrast. Many people like to use textboxes in Word to highlight certain sections of a document, the problem is text boxes aren’t accessible. However, if you want the same look you can modify an existing style within Word for the same effect. Select the section of text you would like highlighted and boxed. Goto the home tab, and in the style menu select “intense quote”. At first this will make the text blue, italicized, and between two blue bars. Now right click on “intense quote” in PC or control click on a Mac to modify this style. You can change the text to black, and bold, or whatever you would like. At the bottom of the window you can select format and then select borders. Now you can choose a box and you’ve just achieved the same look, but accessibly. You can modify it to achieve various looks. You can do these modifications for this document only or save for future documents. Alternative text (alt text) is probably the most confusing topic when thinking about accessibility. In general, alt text is adding a description to a picture, table, graph, or any image in a Word document, PowerPoint, PDF, or Excel which can be read by a screen reader. The key is what you put in for alt text. It needs to be a description of what the picture, table, or graph is. If it is a picture of Harry Truman, the alt text could be “Harry Truman.” If it is a picture of an atom, the alt text might need to be much more descriptive of what the picture is showing. It is important to think more critically about what images we put in documents, and what information we assume people will get out of the image. On the COLRS website are some images, along with the alt text and captions. The alt text will only be read by a screen reader. The captions will be read be everyone. These are all taken from an anthropology course developed by Alex Markovic, Ph.D. at UIC, who gave permission to share his materials. It is important to note that he had never taken an online class, nor taught an online class, and he was developing the first online anthropology class for UIC. The idea of alt text was new to him. The only instructions he was given were to describe the pictures by thinking about what he’d like a visually impaired student to get out of the pictures included in the class. He did a wonderful job on 100+ images in his course. Below are sample of them. 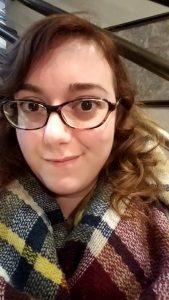 February 26, 2018 / vmart02s / Comments Off on Number or bullet lists? Lists or outlines are a perennial favorite way of organizing content. But there are some things to keep in mind. If something occurs in order, use a numbered list. If order does not matter use bullets. And if you’re using a numbered list as an outline don’t force spacing by using extra returns, or other odd functions to force a look, go with what Word gives you or allows. The accessibility checker can give you some odd errors if you do this, and it can take a lot of time to fix them. In Word, tables can be problematic. They should be used for tabular data, they are often used for page layout. The top example below shows a table used for layout. In this case, the Word autochecker will give you an error, and a screen reader user will have difficulty. A screen reader sees row 1 as 5 cells merged into one and expects everything below it to also be one large merged cell. Then it encounters row 2 and sees 1 cell and 4 cells merged into one. To a computer, this does not compute. What the computer wants is a header for each column with every row below that containing the same number of lined up columns. If page layout like this is desired, using tabs for spacing may suffice. The second example is how a table should be setup, with headers and the required information below it. It is fine to use a table in a syllabus for listing readings and assignments. Define the header row. Don’t merge cells. And it is fine to have empty cells. The Department of Education’s Office of Civil Rights investigates cases of discrimination, disability discrimination is a part of their caseload. They have a policy of investigating and attempting to close cases within 180 days. Until recently, the only way to know who was under investigation was to receive notice of investigation, or by word of mouth. Annual numbers of total cases have been available in the OCR’s annual budget, 2017 budget ( about 4,485). However, as of the beginning of February 2018 the OCR has made available their pending cases on a searchable website. When using videos for educational purposes, they need to have audio descriptions. What are audio descriptions? They are a spoken, verbal explanation of what is occurring in the video. The audio descriptions are captioned, as well. For an example, take 3 minutes to watch these two, almost identical 1.5 minute videos. Close your eyes and listen to the first video. Do the same thing and listen to the second video. The first video probably made much less sense than the second, and hopefully illustrates the use and value of audio descriptions. When using videos in class or online they need to have captions which are 99% accurate. If you have created your own video and are using Kaltura within Blackboard, these directions from the ITS website can help you. If you created your own video and are using YouTube, these directions from the COLRS website can help you. If you are using a video on YouTube which you didn’t create and is not captioned, you can use a secondary website like Amara. 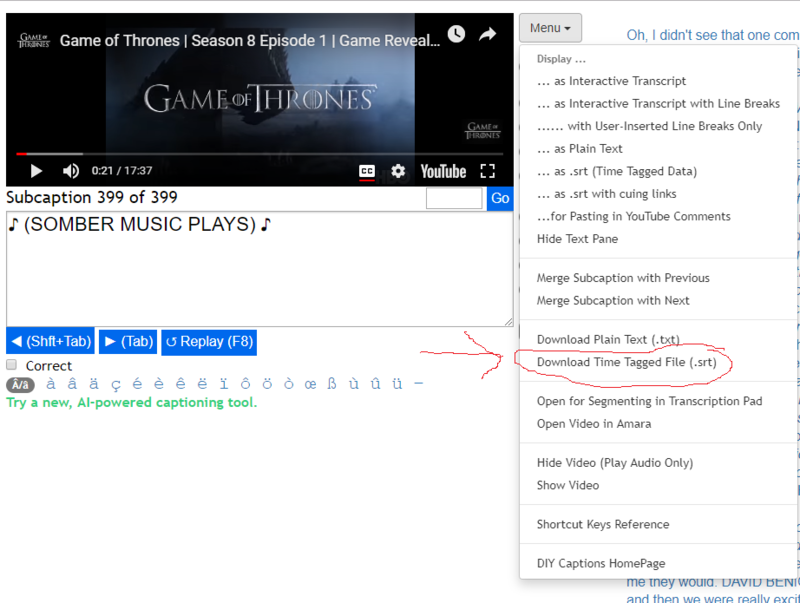 Amara allows the video to remain located at YouTube, but allows you to route the video through their site and add the captions at Amara, so there is no copyright issue. You can even search Amara to see if your video has already been captioned there. Just like with Word, PowerPoint has a built in accessibility checker. This link to Accessibility at the Microsoft website can show you how to run it for Macs or PCs. It also lists some of the most common issues and fixes for PowerPoint. Typically, those are alternative text and reading order. Alternative text is what is read by a screen reader to describe an image in a presentation. If there is no alternative text a screen reader will read there is an image and the size of it. Reading order is the order in which a screen reader reads the information on a page. And while it may seem intuitive to read from top to bottom and left to right, PowerPoint reads in the order which the information was added to the page originally. In Word 2016, for Mac or PC, when using bold or italics for emphasis in a document, consider using the style “strong”. It is in the styles group along with normal, heading 1, heading 2…. A screen reader does not add emphasis to bold or italics, but will if you use strong. In appearance, strong is set to a default bold. However, you can modify the styles to whatever you would like. To learn how to modify your styles go to this page, scroll down to “to modify a link” and use the instructions to set the styles to your preferences. As a general rule, if you add color, bold, italics, or underline for emphasis in a document, consider selecting just one method of conveying emphasis. Around 5% of the population is color blind, and around 2.3% of the population has a visual disability. The color can be problematic for a color blind individual, and none of those methods of emphasis are conveyed through a screen reader. PDFs can be tricky to make accessible. Regardless of whether you are using a Mac or PC, check out the instructions on the Adobe site for making a PDF accessible by running the action wizard and full check. An all text Pdf should be relatively easy following the instructions in the first two sections at the Adobe site. If after running the accessibility full check as outlined in the second section there are no issues identified, then the document is accessible. If there are images, charts, tables, or maps these steps become more problematic, but the instructions in the remaining sections at the Adobe site should help with issues like alternative text and tagging issues. Determining whether a Pdf is accessible or not can be confusing. You can run the built in accessibility checker in Adobe Acrobat Pro to see all the errors, but that doesn’t give a straightforward answer. However, a European non-profit has a free piece of software , for Windows machines, which can help. If you goto the Access for all website and fill out your name and email address you can download the software. With a simple drag and drop the software can give you a green, yellow, or red to let you know very quickly if the document is accessible, needs some work, or needs lots of work to make it accessible. When creating Word documents use the built in styles such as heading 1, heading 2, heading 3…to layout your document. This makes a document more navigable for people using a screen reader. And while Microsoft has odd font and color choices for their default heading styles, you can modify the styles to whatever you would like. To learn how to modify your styles goto this page ,scroll down to “to modify a link” and use the instructions to set the styles to whatever you would prefer. In preparation for the spring semester, make sure you’re able to edit your PDFs with Adobe Acrobat Pro. You can download it for your personal use at the webstore. By having Acrobat Pro, you can edit PDFs, run the built in accessibility checker, and make your PDFs more accessible. In preparation for the spring semester, make sure that your version of Word is up to date, Word 2016. You can download it for your personal use at the webstore. By having the most recent version of Word you can update all old Word files to the most recent version, and use the built in accessibility checker to make your Word documents more accessible.